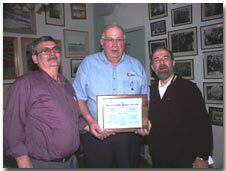 The Canadian Coast Guard Auxiliary awarded on February 9, 2002 its first ever Exemplary Service Medal to Mr. Harry Strong of Old Perlican, Newfoundland. A volunteer member of the CCGA since 1979, Mr. Strong has a long record of outstanding accomplishments for the Canadian Coast Guard Auxiliary. As Chief Executive Officer of the Auxiliary, Mr. Strong has been instrumental in developing the CCGA into one of the most capable and cost efficient lifesaving organizations in Canada.